Just in time for the holidays, Fidelity Charitable released the findings from their charitable giving research study about the things that keep donors from giving, and how to best address these concerns. 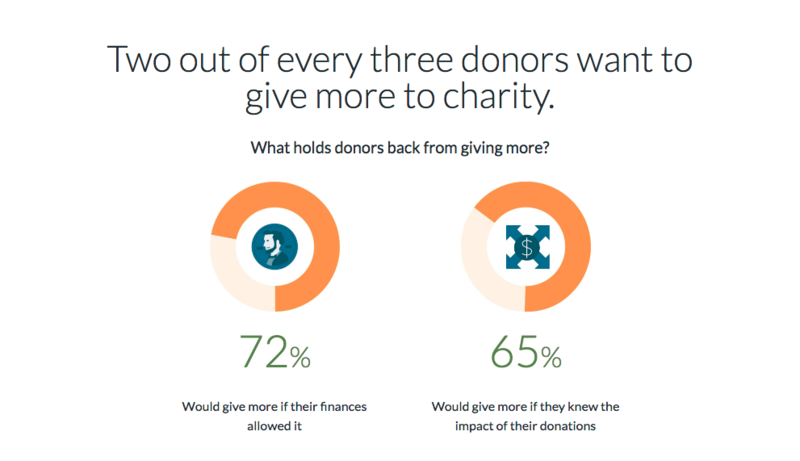 They found that almost two-thirds (64%) of donors would like to give more to charity. Nearly three-quarters (72%) of respondents cited personal finances as an obstacle to giving, while 65% were concerned with the impact of their giving. The complete report is available here. Suggestions for informed giving include educating yourself on charitable tax benefits, asking nonprofits questions to understand the impact of your giving and discovering causes where your donations can have the largest impact. Furthermore, Fidelity Charitable hosted a webinar on November 14 that provided tools for giving with greater impact. These resources are worth reviewing in advance of Giving Tuesday, a global day of giving, on November 28. Artemis conducted a study on women and giving for Fidelity Charitable; the report was published in August 2017. Learn more about Artemis’ thought leadership services, including more work for Fidelity. Sarah has been acting as a marketing consultant and writer for Artemis since 2012. Find out more on her website. Sign up to be notified by email when there are new Artemis blog posts. © 2019 Artemis Strategy Group. All rights reserved.